This classic studio monitor was available variously from September 1974 to December 1995, despite the appearance of the successor to its domestic stablemate, the NS2000, in the early 1980's. It is rare for an audio product to come of age (at 21 it's an adult in any culture) without any fundamental changes in design. The 'M' suffix denoted the black ash vinyl wrap chipboard cabinet in place of the domestic ebony veneered, solid wood version that weighed an extra 8kg! The non 'M' version was also externally larger and 30% more expensive back in the day. You old scribe has only seen black versions, suggesting that, in the UK at least, the monitor outsold the domestic. 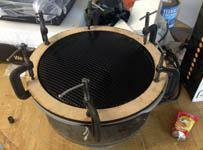 The 25mm chipboard carcass (30mm baffle) of the NS1000M is braced by a 25mm birch plywood circumferential brace. This will somewhat mitigate the disadvantages of that lower cabinet mass, especially in the bass, while the lower mass is often an advantage in the mid and treble ranges. All internal corners are filleted with hardwood too. Back in the 1979, the Yamaha NS1000M were around £700GBP per pair in the UK but they were less than US$500 in North America when introduced in 1974. These wildly differing figures need explaining to the TNT-audio.com global readership and indicate how UK currency was wobbly and UK inflation ran at over 20% in those days before the European single market; British prices were frequently considerably higher than the rest of the world - hence the irrelevance of offering Euro (a currency that didn't exist back then) or US Dollar equivalents here now. More useful are direct local comparisons. The UK price was similar to the contemporary British Kef 105 (Daleks) and IMF TLS80, but more expensive than the Dahlqhist DQ10 or JBL L110. The Yamaha NS1000M was a 3-way design with passive crossovers and passive L-pad level controls on the midrange and treble sections. The Yamaha NS1000M 3-way loudspeaker has a 305mm pulp-cone bass driver protected by an individual grille, 85mm beryllium done midrange and 30mm beryllium dome tweeter. Both the midrange and treble drivers feature phase correcting assemblies. These are incorporated into their protective individual open mesh metal protective grilles, encouraging the Yamaha NS1000M, to be used with the drivers visible. The crossover frequencies have been chosen to fall outside the most critical region of human perception (most 2-way designs cross over at a point between 2,000 and 3,500Hz). The Yamaha NS1000M crossover points are 500Hz and 6kHz. Gentle 12dB per octave (12dB/8ve or second order) slopes are chosen, which eventually tend towards fourth order (24dB/8ve) acoustically, out of pass-band, when summed with the driver responses. The crossover allows level adjustment of mid-range and treble feeds. 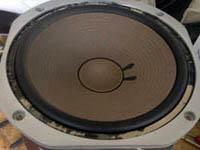 This added crossover complexity was frowned upon in the UK, where the contemporary Haymarket press, for example, lauded 2-way loudspeakers, like the Mission 770, on the grounds of their crossover simplicity. Yamaha stuck to their crossover guns and also, unconventionally used banks of 6 small capacitors to achieve the necessary values for the bass to midrange crossover point. This can lead to lower ESR, lower stored energy, cancellation of tolerance errors and longer service life at the expense of increased cost. The review samples have been modified by relocating the crossovers outside the hostile cabinet environment. The Yamaha 85mm beryllium dome mid-range driver has become the stuff of legends. Considering the Focal beryllium treble driver did not appear for another 20 years, and at a premium high-end market position, this is a big chunk of difficult to manufacture metal. It would be hideously expensive to produce, even today. It is not a one trick driver, being backed by a vented pole-piece, loaded by an absorbent chamber to lower fundamental resonance. The Fs around 300Hz is controlled by the chamber, enabling the 500Hz passive crossover point without too much power handling compromise. The beryllium driver material of the Yamaha NS1000M was manufactured by a vapour deposition process onto a copper plated aluminium base form. Like several 12 inch (30cm) bass driver boxes from contemporary Japanese manufacturers at that time, Yamaha chose a second order bass alignment. Psychoacoustic research has indicated that second order bass alignments, rolling off at 12dB per octave (12db/8ve) below system resonance, seem to have better rhythm and bass timing than 24dB/8ve reflex loading. The transient response is measurably superior of electrical simulations of 12dB/8ve slopes than of 24dB/8ve responses if other factors are equal. Theoretically this could yield better PRaT. The most important of these factors is system Q. In bass alignments this might be thought of in terms of electrical filters (they are, after all, merely electro-mechanical filters). There's a lot of information about the Yamaha NS1000M on t'interweb and some of it is true. Opinions differ on what is the actual bass alignment of The Yamaha NS1000M. Fortunately, the Old Scribe's library includes a bound set of 1979 HiFi Choice, from the days when each issue covered just one component. The final test in the alphabetically organised loudspeakers issue provides anechoic graphs of the Yamaha NS1000 suggesting a low Q function, close to Bessel perhaps. The system resonance is at 40Hz, where the slight knee is about 9dB below the average pass-band and the -6dB point appears to be at around 50Hz, suggesting a Q below 0.5. This could result in excessively dry sounding bass and compromised power handling, but the alignment in the room will depend on its proximity to walls and floor, which is advised to be close, especially reinforcing the frequencies below driver-to-wall distance. The only way to avoid balancing the compromises of bass roll-off would be to build a wall around the circumference of the earth, reaching to the upper atmosphere and mount drivers in it with infinitely compliant driver suspension. If he were interested in loudspeakers, a certain presidential candidate might consider this a worthwhile experiment, but the rest of us have to compromise, with unequal air mass on each side of the driver surface and real world springy drivers. The interaction of air and suspension compliance is loaded by driver moving mass and air load, all obeying Hooke's Law in a complicated interaction around system resonance. Yamaha chose a more expensive (bigger driver in bigger box) solution to achieving the low notes, in pursuit of more accurate phase performance and greater in-room bass extension. Yamaha could have chosen to specify 25cm or 20cm drivers in a reflex box like many American and European models of the day. Their decision to opt for the more expensive big chassis in sealed box was risky but in line with Japanese competitors at the time. This bass driver featured Yamaha's unique selling point of using pulp from the same quality of spruce they use for grand piano sound boards. This is a great way of capitalising the off-cuts, whether or not it makes an audible difference. The low Q, gentle slope bass roll-off is designed for rear wall loading in small control rooms. At low frequencies the wavelengths are long. This means that nearby objects (such as the rear wall) behave as though part of the source object (the loudspeaker) rather than creating an out of phase reflection. This is why the second order bass alignment sources (as in the Naim SBL and DBL models) work with the room boundaries to provide a predictable in room bass response with fewer peaks and troughs (antinodes and nodes) in the room space. The Yamaha NS1000M needs a different placement routine than the Wilson method used for free space maximally flat or 4th order (Q=0.707 or 24dB/8ve) loudspeakers. Mounting loudspeakers close to the rear wall does bring its own compromises. The closer a loudspeaker is placed to a rear wall, the more early reflections occur. These early reflections cause amplitude and phase anomalies (like a comb filter) that affect soundstage and high frequency accuracy. The LEDR test remains the best available set up tool to help, by trial and error, to identify and mitigate or remove early reflection problems. Your Old Scribe's room has large (6 square metres) argon filled triple glazed windows 250mm behind the nearest possible speaker plane, with wooden Venetian blinds (that act as acoustic diffusers) in front of them. Similar techniques as mobile sound systems used to project bass forward, were used to create solid 'wings' around the Yamaha NS1000M, simulating wall loading for the bass, enabling their bass performance to work as the designer intended. Although designed to be used flat against a rear wall, the soundstage benefitted from a little toe-in (about 15 degrees). They worked best in an isosceles triangle with the listener, 2.8m between speakers, 3.4m from speakers to ears. The midrange and treble drivers are mounted off-centre and the NS1000M are supplied in symmetrical, handed pairs. When used flat against the rear wall, Yamaha advise the choice of left and right cabinet so that the tweeters are nearer the outer edges. 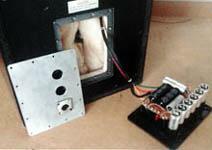 Extensive trial and error with other listeners led to that 15 degree toe in with the tweeters nearer the inside edge. These initial trial and error experiments optimised the 30 kg Yamaha NS1000M in this listening room and once set up they required no further tweaking. The 678mm(h) x 375mm(w) x 295(depth plus driver protection & sockets) Yamaha NS1000M is designed to be mounted around a mixing console (big old analogue things) where the midrange drivers will be at ear height. 385mm high stands were supplied by Gary Hargreaves, an engineer audiophile who creates one-off frames and stands for audio alongside his core business. 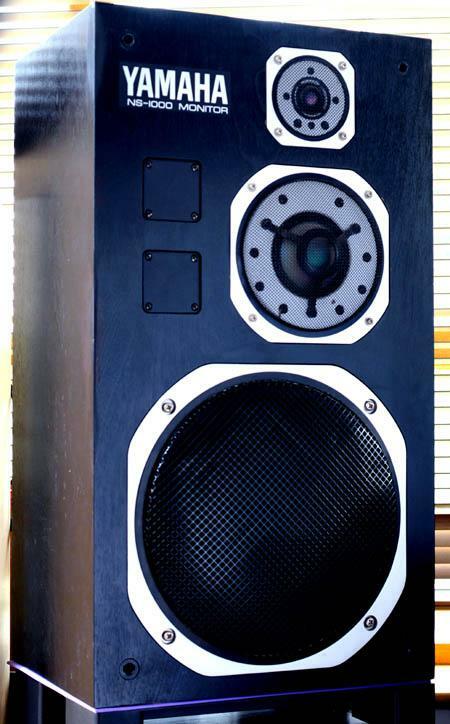 Gary has experimented with stands for the Yamaha NS1000M, one of his favourite loudspeakers. He has found the balance of compromises better with lossy interfaces between cabinet and stand, and between stand and floor. Between cabinet and stand he recommends a cut sheet of sound absorbing material and supplied the proprietary type used between machinery, like printers, and their supports. Your Old Scribe's past tests with different loudspeakers tend to favour 3 hard spikes, but there are exceptions and Gary has tried a variety of alternatives before reaching this conclusion. Likewise, these stands have 4 legs and 4 points of contact with the floor, the compliant interface avoiding the problems created by 4 points of contact instead of the inherently more stable tripod. Gary finds, especially with wooden floors, that compliant feet are better when 4 legs are needed for stability. With compliant feet (as in the BrightStar Isonodes reviews the 3 vs 4 vs 3 feet argument is moot because the advantage of 3 only applies to hard interfaces. With 4 hard feet, one of them inevitably does not make full pressure and may 'chatter'. The stands will be separately reviewed and their claims put to the test. The passive crossovers have been removed from the hostile interior of the cabinet to vibration isolated boxes mounted on the stands. Immediately, the Yamaha NS1000M impress in two fundamental ways that over time do become their most enduring memorable qualities. Low frequencies and transparency. Portrayal of rhythm is exemplary, justifying the choice of large driver in big sealed box. The Yamaha NS1000M has therefore been justifiably popular with the Flat Earth community for the portrayal of PRaT and this pair confirms that choice. The Yamaha NS1000M also manages to portray low frequency pitch accurately; Talking Head's True Stories offers examples of drum skins allowed some sustain, which are clearly articulated. This prompted another bout of Billy Cobham, Stanley Clarke, Weather Report and Canterbury cliches. This demonstrates their second salient quality, that they are ruthlessly revealing loudspeakers. However, they are not relentless, like some near-field monitors can be when transplanted from in-wall to domestic settings. The Yamaha NS1000M became the main loudspeaker for hours of extended listening. Without the benefit of beguiling valve amplifiers, using some Hypex modules, some audiophile recordings including two well-known Blues favourites, seem less magical. However, complex jazz-rock fusion really comes alive with the tight rhythmic bass alignment and clean midrange. Indeed, The Yamaha NS1000M has a forward midrange when the level controls are supposed to be flat. Setting the midrange control one or two positions down sounds more balanced. Whether the treble needs the same adjustment, varies with listener and recorded material. The usually magnificent 55Wpc Canor TP106VR+ struggled to drive these ostensibly 90dB sensitivity boxes to your Old Scribe's definition of 'realistic levels'. Smaller single ended triode valve amplifiers (6080 or 300B) failed to get them off the ground at all. However, one visitor used terms like "ear splitting" and "tinnitus" to describe your Old Scribe's definition of 'realistic', when visiting during the tests. 100Wpc muscle amps (silicon or thermionic with big iron) or 200Wpc class D ought to be minimum in any room of 20 square metres or more. Overdriven amplifiers are more damaging to passive crossover loudspeakers than bigger amplifiers. The Yamaha NS1000M does not, despite the preceding paragraph, favour any particular genre. Complex orchestral works and simple ensembles work equally well. Human voices, like Caravan's whimsical trio of vocalists, can better demonstrate their individual qualities, within harmonies, through the density of the mix. Your Old Scribe has not often enjoyed dome midrange units, finding those from Dynaudio, ATC, Morel, Phillips and others less satisfactory than cones, ribbons, compression horns or electrostatics, for differing reasons. The 85mm beryllium domes of the Yamaha NS1000M never made their shape an issue, handling the most critical region of the audible spectrum with aplomb. This driver diameter has the advantage that it is not beaming as much as cone or planar drivers, helping an even in-room frequency balance. From the outset, an obvious and weak area of Yamaha NS1000M performance is the high treble. The combination of the Dynavector XX2 MkII and the beryllium tweeters tend to exaggerate surface noise but not just because these loudspeakers are otherwise so revealing. Above 10kHz there is little information competing with some strong resonances, judged by today's standards, but still superior to any soft dome. Some frequency sweeps were run to identify whether this is a sample problem (due to age) or inherent in the design. Above 10kHz the response drops quickly before rising to a rough sounding peak at about 16kHz which will upset younger listeners more. The response then plummets to inaudibility before 20kHz. 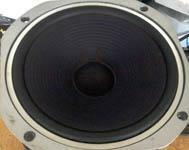 The 16kKz resonance is more audible at high volumes; perhaps the tweeter resistor heats up and changes value. Before refurbishing and upgrading those big passive crossovers, the 21st century audiophile might want to consider how much some OFC Litz inductors and a bank of couture paper-in-oil or high-end film capacitors will cost. Then notice what a trio of class D amps and a pro sector electronic active crossover might cost instead. Watch this space for just such an eventuality. The otherwise accurate frequency response, with no obvious peaks or troughs helps achieve an accurate representation of timbre, literally the character of an instrument, the term implying it was originally attributed to the wood they were made from. This is essential for any loudspeaker attempting to provide the accuracy worthy of the title 'monitor'. The Yamaha NS1000M has acquired a cult status among certain cognoscenti, while being largely forgotten by some audiophiles. Their old market position as boxes seemingly twice the price (more for the domestic version) of popular alternatives (like the aforementioned Mission 770) would now be considered almost budget in comparison with the numerous offerings costing tens of thousands. The even frequency response, and lack of obvious resonances below 10kHz, makes these old timers easy to forget and just enjoy tune after tune. Used prices vary dramatically in different markets. Their growing status means that major hacks, like different tweeters, should be reversible if they're not keepers. On the basis of this pair, once enjoyed, Yamaha NS1000M is likely to be kept as an accurate reference, even when a flavour of the month temporarily displaces them. Go and read my review of the active version of these speakers by Chevron Audio.